The New Ballard's Branch Bogtrotters took their group's name from the original Bogtrotters, the famous Galax, Virginia, area band of the 1930s, and because band leader Dennis Hall lives on Ballard's Branch. Galax is home to the world-renowned Old Time Fiddler's Convention, and the area has traditionally produced some of the country's finest old time string bands. 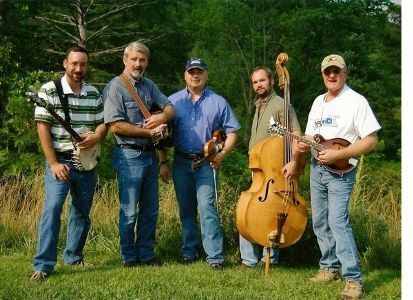 Carrying on that rich musical tradition, the New Ballard's Branch Bogtrotters features Dennis Hall on guitar, Leon Frost on mandolin, Jesse Morris on bass, Eddie Bond on fiddle, and Josh Ellis on banjo. The guys have been playing together for over twelve years. Saturday, April 28th, 2012, at 7:30 p.m. the Carter Family Fold in Hiltons, Virginia, will present a concert by the New Ballard's Branch Bogtrotters, an old time band. Admission to the concert is $7 for adults, $1 for children 6 to11, under age 6 free. Eddie Bond's four great grandfathers were old time banjo players. He was raised by his grandmother who was a singer and guitar player. His family on both sides is packed with musicians who played the traditional music of the Blue Ridge. Eddie began performing at age 3 dancing for quarters. Through the years, he's added guitar, autoharp, fiddle, and banjo to the list of instruments he plays. He grew up in Fries where some of the first old time music had its beginnings at the Washington Cotton Mill from 1923 to 1929. Fries is about six miles from Galax. Dennis Hall is a grand nephew of Uncle Eck Dunford - the droll voiced fiddler and spokesman for the original Bogtrotters. Their dance band was recorded by Alan Lomax in the 1930's. Lomax left a trove of important recordings by the Bogtrotters and others at the Library of Congress. Uncle Eck was very conscious of his Ulster Irish background and his name. The Bogtrotter heritage is closely tied to that of Eck Dunford. Dennis is noted among old time musicians for his unerring and rock-solid guitar time. In addition, he's a master carpenter and home builder. Dennis is the keeper of a rich score of older, historic music. Jesse Morris is a bassist and the son of a bassist. His timing is rock solid. Jesse comes from a musical family. His father, Dale Morris, has been a string band musician for many years, working in many Galax bands; he's also a respected scholar of traditional music. When he isn't playing music, Jesse teaches high school agriculture classes. The group won the old-time band competition at the Galax Fiddler's Convention on six different occasions. In addition, they have played their music at such regional and national festivals as the Blue Ridge Folklife Festival, Merlefest, the Smithsonian Folklife Festival, and the University of Chicago Festival. Having performed many times at the Fold, they're a favorite of Carter Fold audiences. This group covers it all - great fiddle and dance tunes, outstanding vocals and harmony, beautiful gospel numbers, waltz tunes, and some of the finest instrumentals you'll ever hear. For more information on the New Ballards Branch Bogtrotters, go to NewBallardsBranchBogtrotters.com. If you love old time music and dance, don't miss the New Ballard's Branch Bogtrotters at the Carter Family Fold. Everyone loves the Bogtrotters, so get ready for an evening of old fashioned fun. Be sure to bring your dancing shoes - you'll need them! Carter Music Center is part of the Crooked Road: Virginia's Heritage Music Trail. You can visit the Crooked Road Music Trail site at TheCrookedRoad.org. Partial funding for programs at the center is provided by the Virginia Commission for the Arts and the National Endowment for the Arts. For more information on Saturday's concert, contact the Mountain Music Museum at 276-645-0035. For recorded information on shows coming up at the Fold, call 276-386-6054.